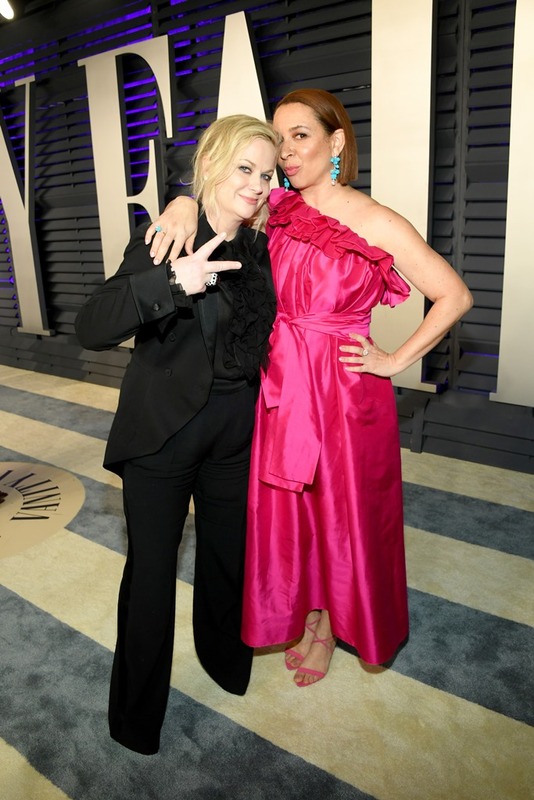 Amy Poehler has added so much to the girl talk lexicon, from Galentine’s Day to a whole slew of compliments for your best friend. Now she adds “witchy circle” to her contributions, and if you think I’m not having custom paper products printed with “witchy circle” for my next girls’ weekend you are a fool. That’s what the Amy Poehler and Maya Rudolph joint-profile in Vanity Fair is about—girls’ weekends, and how Poehler and Rudolph’s SNL girl gang resulted in Poehler’s latest directorial effort, Wine Country. It’s based on a real trip Poehler planned for Rachel Dratch’s birthday in Napa Valley and nothing about any of our lives will ever be as great as getting to go on an Amy Poehler-planned wine country trip with basically every 21st century SNL lady-star. But really, underneath the FOMO-inspiring travel details, what this double profile is getting at is something we’re seeing a lot of recently—the relationships between women who work together. This profile is about women who work together who fell in love with working together, and have just kept right on working together. The pop culture myth of female friendship is that it’s either impossible because of competition, or the only long-lasting female friends you will have were made in childhood (before competition sets in). If you have life-long friends, that’s amazing and awesome. But for a lot of us, it’s not reality. I, for instance, moved a couple times during childhood, in the pre-email days, when keeping in touch required a little more effort than a ten-year-old can muster. I have a couple friends from my summer camp days, but at this stage, my closest friends have come from work connections. We also need to celebrate friends with whom we work because it dispels one of the most toxic myths about women: that we can’t get along, work together, or be friends in a competitive work environment. That’s bullsh-t and we all know it, but there isn’t much in pop culture to dispel the myth. Usually women at work in pop culture are either isolated, the only woman in the room, or they’re caught up in some toxic competition bullsh-t with another woman, reinforcing the stereotype (Isn’t It Romantic lampooned this with Betty Gilpin’s character). But recently we’ve started to see women who aren’t just friends, but are specifically friends in a work context (the most recent being Carol Danvers and Maria Rambeau). And now we have Vanity Fair devoting a profile to a real-life work friendship that is, in turn, producing pop culture about women in work friendships. We need more of this. We need more witchy working circles.